Many people are surprised to hear that Mo’Nique’s meteoric career began in her early 20s, when she took the Improv comedy stage on a dare from her brother. That spontaneous decision and standing ovation changed her life, convincing her to pursue a career in stand-up comedy, which led her to such notable shows as “Showtime at the Apollo,” HBO’s “Def Comedy Jam,” “Apollo Comedy Hour,” HBO’s “Snaps,” BET’s “Comic View,” The Montreal Comedy Festival and Uptown Comedy Club. A pivotal career move landed the talented comedienne in the memorable role of “Nikki Parker” on the UPN comedy series “The Parkers.” The show’s five-year run earned Mo’Nique numerous awards, including four NAACP Image Awards for Outstanding Actress in a Comedy Series in 2001, 2002, 2004 and 2005. Mo’Nique also served as host of the legendary talent show, “Showtime at the Apollo” for three years, making history as the first comedienne to serve in that coveted role. 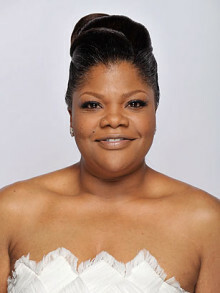 Along with Mo’Nique’s commercial success and award recognition came popular and visible roles in films such as the Showtime tele-film, “Good Fences,” opposite Whoopi Goldberg, “Welcome Home Roscoe Jenkins,” “Farce of the Penguins,” “Beerfest,” “Shadowboxer,” “Phat Girlz,” “Domino,” “Soul Plane,” “Hair Show,” “Three Strikes,” “Baby Boy” and “Two Can Play That Game,” which earned her an NAACP Image Award nomination for Outstanding Supporting Actress in a Motion Picture. She is also starring in the upcoming Lee Daniels film, “Precious,” which depicts the story of an overweight, illiterate teenager who is emotionally abused by her deadbeat mother and father. The film took home the Grand Jury Prize and the Audience Prize at the 2009 Sundance Film Festival, and was recently purchased by Lionsgate Films with support from Oprah and Harpo Productions, as well as Tyler Perry, and will be released in late 2009. In 2002, Mo’Nique joined Adele Givens, Laura Hayes and Sommore for the mega comedy tour, “The Queens of Comedy,” which was also released as a film and as an album of the same title, earning a Grammy nomination for Best Spoken Comedy Album. In 2005, Mo’Nique created, executive produced and hosted the Oxygen television special, “Mo’Nique’s F.A.T. Chance,” America’s first full-figured reality beauty pageant. The program was the highest-rated network special on Oxygen, and in 2006, earned an NAACP Image Award nomination for Outstanding Variety Special. The third season was shot entirely on location in Paris – a network first. Mo’Nique’s other reality show credits include the VH1 series, “Charm School,” which was a ratings winner for the network. Always embracing her full-figured woman status, Mo’Nique has used her celebrity and gift of comedy to advocate for voluptuous women everywhere. Her funny and inspiring book, “Skinny Women Are Evil,” released in April 2003, was published by Atria Books, and became a New York Times bestseller. She and co-author Sherri McGee McCovey released a follow-up called “Skinny Cooks Can’t Be Trusted” for Amistad Press, a division of Harper Collins. The duo also co-authors the teen fiction series, “Beacon Hills High,” which was just nominated for a 2009 NAACP Image Award in the category of Outstanding Literary Work for Youth/Teens. While effortlessly managing all of these projects, Mo’Nique still found time to host BET’s signature BET AWARDS show in 2003, 2004 and 2007. She currently hosts “The Mo’Nique Show” on BET. Do you want to hire Mo’Nique? Directly request a quote. In 48 hours we can send you the availability of Mo’Nique If you would like to book Mo’Nique, Entertainment Booking Agency is the right place. We will offer you the best price and contact the management or we directly contact Mo’Nique. For corporate appearances or speaking engagements you can contact our agents and the will help you true the process. Tags: hire Mo’Nique, Mo’Nique booking, book Mo’Nique, Mo’Nique appearances, find more information on booking Mo’Nique for appearances, Mo’Nique speaking engagements, Mo’Nique endorsements/spokesperson, Mo’Nique appearance fees, Mo’Nique booking agency contact info, biography of Mo’Nique, Contact an artist booking talent agent find a speakers bureau that can book Mo’Nique, speaker booking agency for Mo’Nique, Mo’Nique booking agency, Mo’Nique booking for corporate event. EBA is one of the biggest entertainment booking agencies in the World. We book hundreds of celebrities, artist, athletes and speakers in a year. Important to know is that we are not claiming to be the management of Mo’Nique. We are not the official agent for Mo’Nique. Companies from around the globe book these artists and speakers true our company be course we have one of the biggest networks and we always have direct contact with the artist or the management. We help you to find the right celebrities for your corporate of private events. Please contact one of our agents to get free advice and we will help to get the world-famous artist on your party.